This post previews two first round matches on Wednesday’s schedule from the Porsche Tennis Grand Prix main draw in Stuttgart including Lucie Safarova v Karolina Pliskova and Andrea Petkovic v Kristina Mladenovic. In case you missed it, you can read a preview of the full main draw on mootennis.com HERE and highlights from day 1 at the tournament HERE. The pick of the first round matches in terms of ranking is an all-Czech encounter between the world number 15, Lucie Safarova and the world number 18, Karolina Pliskova. Safarova is still seeking her first set in singles action this year after making her return to the tour in February following complications of the bacterial infection she suffered at the end of 2015. It’s going to be a long struggle but Lucie’s attitude seems spot on. Her results in doubles with Bethanie Mattek-Sands, winning Miami and reaching the final of Charleston, were very encouraging signs. Pliskova’s form has been that of a yoyo… there’s been some really good stuff, notably a semi-final showing at Indian Wells, but quite a lot of patchy results too. Pliskova has been the star of the Czech Republic’s last two Fed Cup ties, but it wasn’t all plain sailing for her last weekend; she lost from a set and a break up against Viktorija Golubic, but rebounded on day two to defeat Timea Bacsinszky in straight sets and team up with Lucie Hradecka to win the decisive doubles. Head-to-head record: Pliskova leads Safarova, 2-1 in their head-to-head; the pair played twice in 2015 with Pliskova prevailing in Antwerp (7-6(5) 6-3, QF) and Dubai (3-6 7-6(5) 6-1, QF). Final thoughts: As a Lucie fan, this is not the draw I wanted to see! There will be a caveat against Lucie’s singles performances for quite sometime as she builds up her fitness. The next step will be to win a set in singles and really get stuck into a match. I think the longer she can stay on court, the better, to build up her confidence and stamina. It’s a series of stepping stones and it will be challenging to make that next step in Stuttgart against Pliskova. As always, heart says Lucie but it’s going to be a very tough match. The good matches just keep on coming… in an all top-30 first rounder, home favourite, Andrea Petkovic will take on Kristina Mladenovic. Since reaching the semi-finals in Doha, Petkovic lost her first matches at Indian Wells, Miami and Charleston; she lost tight three setters at the two Premier Mandatory tournaments before going down to Monica Puig in her most recent WTA match in Charleston, 5-7 2-6. Mladenovic is just one place off her career best ranking of 28, but has had an erratic start to the year. The Frenchwoman has won back-to-back singles matches just once in 2016, reaching the third round of the Australian Open where she scored an impressive straight sets win over Dominika Cibulkova, her first win over the Slovak player in six meetings. Since then, Mladenovic has won just two matches on the WTA tour and endured a four match losing streak between Dubai and Charleston. In her last match on the tour, Mladenovic lost out in a third set tiebreak to Mirjana Lucic-Baroni, 6-4 4-6 6-7(13) having had match points. She did though help her country reach the Fed Cup final at the weekend with a singles win over Richel Hogenkamp and successfully teaming up with Caroline Garcia to win the decisive doubles. Much like Petkovic, the wins in Fed Cup could have a positive impact on Mladenovic. Head-to-head record: Petkovic leads Mladenovic, 3-0 in their head-to-head; the pair played out a tight three setter at the French Open in 2014 which Petkovic won, 6-4 4-6 6-4. In their most recent encounter in Miami last year, Petkovic delivered an assured display against an error-prone Mladenovic to win, 6-0 6-2. Interesting stat: Petkovic hasn’t won a singles match in Stuttgart since that horrible situation when she went over on her ankle against Victoria Azarenka in 2012. 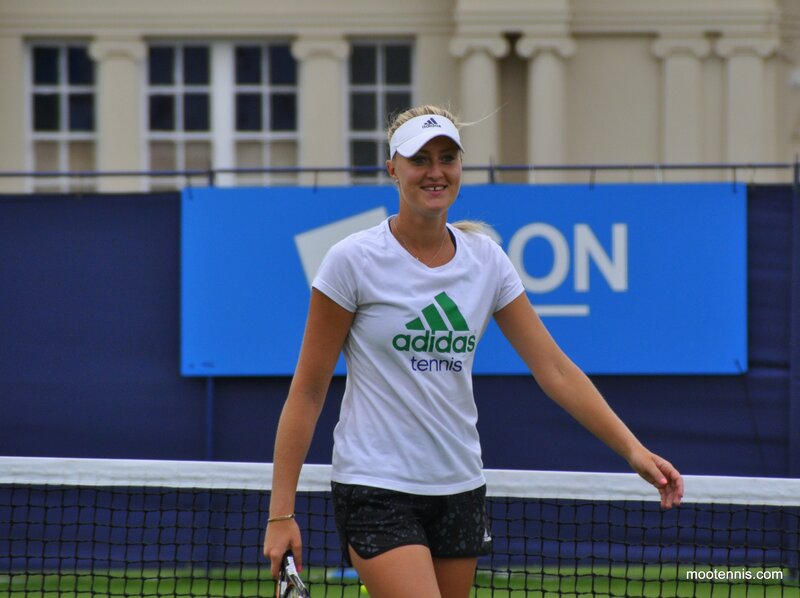 With her elevated ranking, Mladenovic will be playing this tournament for the first time in her career. Fab win for Ivanovic in the end. Still not convinced she’s going far in her draw. I’m going Pliskova and Mladenovic but I wouldn’t be surprised if I was wrong. I’d agree, she’s struggled against both Pliskova and Safarova. I thought Ana played well though, started slow understandably, but was flying at the end. Though I’d say if there was a time to beat Safarova it would be now when she’s not as confident in herself. And with Pliskova it may help her the advantage of playing on clay. But she’s become so unreliable again… you don’t know when she’ll play poorly or when she will turn it on.